In this sequel to normandy you and your squadron will need to take back another village hold by german and at the outskirt of this village ressist to a counter attack. Lot's of objective are include like stole important paper destroy tank and Flag and much more). A special custom intro screen has been made with a list of the missions detailed and layed out like in the original game. Design is well put together in the same way as Normandy and this time it's under an heavy rain. 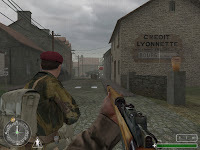 Destroyed city, bomb holes, the church everything make this town really a really battle place during Normandy campaign. I noticed several glitches in design and texturing but they really dont spoiled the general realisation (i'm even not sure you will noticed them). In comparaison with Normandy the map seems to be smaller but attention to details (include sounds) and general layout make it quite bigger in size. Gameplay is straight forward and quite well coded with your squad and the event you're going to encounter. Fights and Combats are easy to complete and won't make you restart a lot of time except perhaps at the end where the counter attack with tiger tanks will make it more. 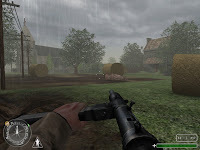 It as to be noticed that sounds (from COD2) and music are well associated and increase certainly the realism and gameplay. In conclusion: Another well put together mission made by Ryan this night has been replaced by rain hopefully it's not too slippery. objectives, combats and especially the mix between them make this release another worth to play one. Sadly it's really too short Just hope that other project are on the way so we could enjoy other mission by Ryan.